An interesting unit that would make an ideal addition to other Sonicsmith boxes, though a harder sell as a standalone purchase. Interesting source for standalone sound effects. Makes a useful addition to other synth hardware. LFO might have benefitted from wider range (into higher audio frequencies). Sonicsmith’s current range is based around hardware using its innovative Audio Controlled Oscillator (ACO) chip. However, the company’s newest offering is much simpler in concept. The Modulor A1 is a small, standalone semi-modular analogue synthesiser. More specifically, it is two patchable oscillator/VCA combos in a colourful metal box. One VCO works in the audio range while the other is configured for LFO/modulation duties. 30mA). Alongside the power socket, the back panel features a single 1/4” mono jack for the main VCO output. The left-hand side of the front panel is dedicated to the audio-rate (20Hz-20kHz) VCO. A Frequency control knob allows you to sweep across the full range, while Fine Tune provides more accurate (+/- 4 semitone) adjustment. A single toggle switch selects the aforementioned square/triangle waveshape and 3.5mm (minijack) sockets provide a direct (pre-VCA) oscillator output as well as inputs for CV control of pitch (at the 1V/octave standard) and Sync (for resetting the VCO phase). The right-hand LFO area of the unit largely mimics that of the audio VCO, though the control knobs now adjust LFO Amount (depth) and Rate (frequency). The Sync and Rate (frequency) inputs and dedicated oscillator output are still present, though there is also an additional CV control input governing LFO Amount. The central section of the A1 provides CV Input to the VCA that follows the main VCO, and a single switch for routing the LFO output to control VCO pitch. Note that the rear VCO output jack runs at a pretty ‘healthy’ level (+4dBu) and there’s no overall volume control, so the only way to adjust audio gain is by using an external signal to reduce the VCA gain via the centrally-placed CV In minijack socket. Armed with only the A1 and a single patch cable, it’s possible to dial in various sync-based and modulated tones. 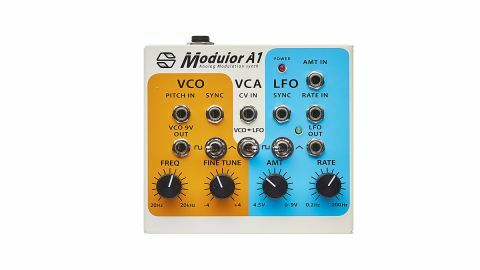 However, by now you should get the idea that the Modulor A1 is not a complete synth as we know it - more an interesting collection of interacting oscillators. It’s capable of usable results, but given that the ‘example uses’ in the manual nearly all require additional units or modules, it should really be seen as a useful addition to an existing setup. Looking at the other units in the Sonicsmith range helps clarify its inclusion as part of their line-up, though one could argue that many other users might find a Eurorack version of this device more useful.